In nearly every other X-Men film and television show, mutants are presented as a relatively new global phenomenon that mainstream humanity is still struggling to make sense of. It’s that “newness” that sometimes makes the concept of mutants having some sense of collective community and shared identity a little difficult to square away. But because The Gifted is set at some point in the future, when the X-Men and the Brotherhood of Evil Mutants have already become known quantities in the world, the show is able to put forth a world where fear of mutants is already widespread enough to have become part of the larger culture. The series’ second episode, “rX,” builds out on series creator Matt Nix’s decision to shape the show as a long-form look at a world where hatred and fear of mutants has become so widespread that it takes on a number of different forms other than just name calling. After overexerting her powers while helping her fellow members of the Mutant Underground get back to their home base, Blink’s body goes into a state of shock and she begins randomly opening up portals that lead back one particular street. One of the portals ends up causing a massive accident after a civilian accidentally drives through it, only to have their car sliced in half. The accident draws the attention of the authorities, and Caitlin reasons that the only way to ensure their safety is to get Blink stabilized with medication that can only be found in hospitals. Sneaking into a hospital to steal drugs is a difficult task in and of itself, but The Gifted further complicates things with the fact that most hospitals actively refuse to treat mutants. Together, Caitlin and Eclipse travel to the last hospital in town that will have them—an over-crowded urgent care facility that only admits them after Eclipse purposefully re-opens an old bullet hole wound to convince the person admitting patients that he desperately needs help. You get the distinct sense that this second-class citizenship is the kind of problem that ultimately ends up putting most mutants’ lives in danger. When a doctor spots bruises on Caitlin’s face, his immediate assumption is that she’s being abused by Eclipse and, for perhaps the first time in her life, Caitlin begins to realize the degree to which people’s casual prejudices adversely affect mutants. Elsewhere in town, Polaris is settling into her new home—a correctional facility in which mutants and baseline humans are forced to live together, a situation that puts the relatively small mutant population in a precarious position. Outfitted with power-dampening collars, the mutants are immediately othered and targeted. Though it isn’t nearly as terrifying as being pursued by the Sentinel Services and their mutant-hunting drones, we’re meant to read this as yet another way that society has turned its back on mutants and put systems in place that are designed to gradually kill them off. 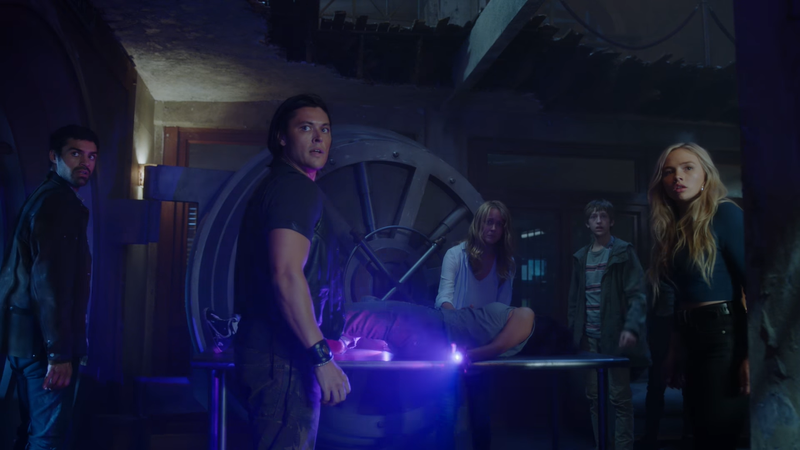 The Gifted is a far cry from some of the more apocalyptic dystopias that other X-Men stories have been set in—and yet at the same time, it’s exactly the sort of world that both Professor Xavier and Magneto feared would become reality. It’s a world where the threat facing mutants has become institutional and pervasive and one that, ultimately, none of them can really fight back against. Eclipse’s blood being bioluminescent was a very nice touch, but it makes you wonder which of his other humors are as well. Amy Acker is very good at playing a harried mother in distress. The scenes featuring Lauren’s shield closing Blink’s portals looked cheesy as hell. It’s fantastic to see so many background mutants just having strange physical traits like red skin and two-tone hair.